When You See 'Trump' On A Building, It Might Not Be What You Think : It's All Politics Plenty of buildings still boast Donald Trump's name in Manhattan, where he became famous as a real estate developer. But he doesn't actually own most of them — and never has. Donald Trump owns this Trump Tower building at 725 Fifth Ave. in New York City. It's one of only a handful he owns in the city, though 17 buildings there bear his name. Donald Trump got his start in real estate, and over the years he's owned and sold many of New York City's great buildings, including the Plaza Hotel and the St. Moritz. His image as a developer endures, even though these days, Trump's real estate holdings are surprisingly sparse. 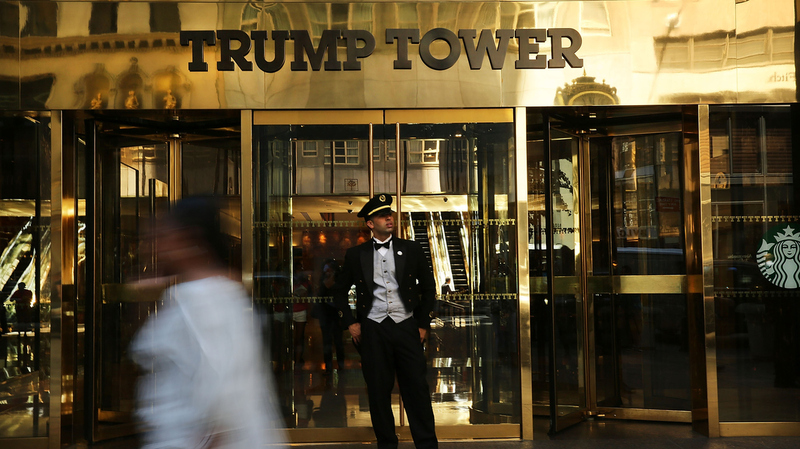 Ever since his presidential campaign took off, the Trump buildings have become full-blown New York City tourist attractions. Tour guide Ned Callon recently led a group of French and Chinese tourists as they snapped selfies beneath an oversized gold "TRUMP" sign at 40 Wall Street. He pointed it out, adding it's "now known as the Trump Building." "He is not a shy man," Callon said. "His name is on every single one of his buildings here in New York City." That oversized Trump name also appears on a series of luxury towers overlooking the Hudson River. But like many of his Manhattan properties, Trump doesn't actually own them. The towers are part of a West Side development that solidified Trump's real estate legacy in New York. They also set a pattern he followed on other projects, of licensing his name to other developers. Back in the 1970s, The Donald wanted to build the biggest shopping mall on the East Coast, and New York City's tallest building — 150 stories. The project, called Riverside South, was controversial, said developer Jeff Gural, chairman of firm Newmark Grubb Knight Frank. "Riverside South was a very risky project at the time; a lot of people questioned the viability of building apartments so far west," he said. Trump's plan met with fierce opposition from the community. Back then, Trump insulted Ronnie Eldridge, the city councilwoman who led the opposition, in a way that sounds much like his recent jabs at Fox News anchor Megyn Kelly. "Ronnie Eldridge doesn't know what she's talking about. ... Ronnie Eldridge is second-rate in just about every way," Trump said. "She's just a woman that doesn't have a great grasp of finance or anything else." At the time, Trump reportedly owed Chase Bank millions on the loan for the West Side property. As he waited for city approval, his interest bills were piling up. Meanwhile, his Atlantic City projects were going bust. Councilwoman Eldridge used Trump's money woes to argue against the development. "Trump owes close to $250 million to Chase for the site. He is in a half-dozen bankruptcy situations and has spent the last two years averting a complete collapse," she said at a City Council meeting back then. Trump ultimately won city approval, but he ended up having to sell the development to investors from Hong Kong long before it was finished. Part of the deal included leaving Trump's name on the buildings. "So even though people think it was Trump's project, at that point he had sold it [and] the only thing that remained was his name on it," says Daniel Gutman, an environmental consultant who helped to shape Riverside South — also called Trump Place. Gabby Warshawer, the director of research with CityRealty.com, says Trump's West Side project is an example of his real success — in licensing his name to other projects and buildings. "Because a lot of buildings have been branded as Trump properties, it's assumed that Trump owns a lot more than he does," she says. Trump may no longer be considered one of the city's pre-eminent real estate developers. But he's been successful at making the buildings that do bear his name synonymous with opulence. Warshawer says the condo units in Trump buildings command a premium. The properties also provide Trump with international name recognition — a priceless commodity for any presidential hopeful.